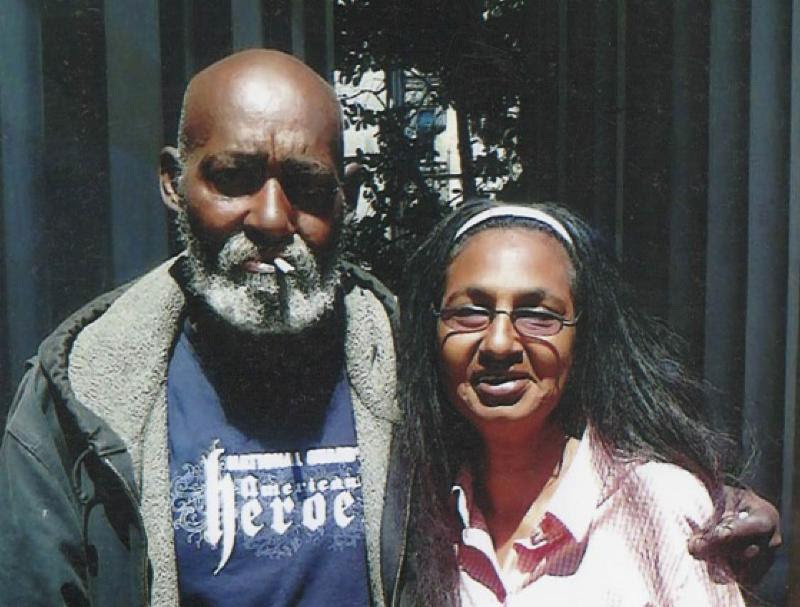 One year ago yesterday, 62-year-old Wilbert Williams was sleeping in a tent next to a Highway 80 off-ramp at Fifth and Harrison Streets at about 1 a.m. when he was run over and killed by a drunk SUV driver who veered off the road. I turned on the television, and heard the story of a man hit by a car in his sleep. The car drove straight through the 5th Street offramp into an adjacent park. I saw my husband’s friends talking to the camera. As I searched for Wilbert on the screen, all I could see were his belongings — a sign written in his handwriting, his hat, his pillow and his wagon. My heart began to drop. I raced over to the scene as quickly as possible. As I was driven to the morgue — not the hospital — I prayed I would not find my husband… that it was someone else. That day, my hopes were shattered and my life forever changed. I lost the love of my life. And on top of it, I faced prejudice. 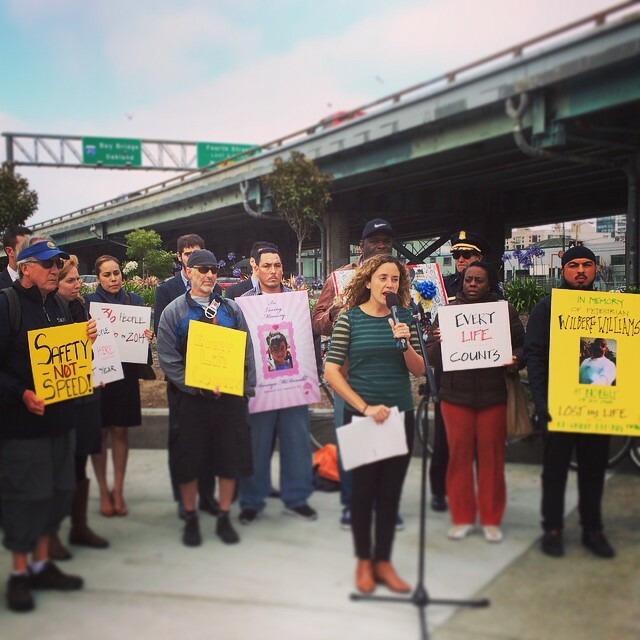 Safe streets advocates held a memorial yesterday near the site where Williams was killed, highlighting the dangerous driving encouraged by the freeway ramps. The Vision Zero Coalition, led by Walk SF and the SF Bicycle Coalition, called for urgent action from Caltrans, the state agency that controls highways and the city streets where freeway ramps touch down. With a decades-long legacy of gouging highways through cities, the agency still tends to disregard the burdens that grade-separated limited-access roads impose on urban neighborhoods like the South of Market District. The data collected by the SF Department of Public Health in recent years reinforces what’s already known by just about anyone who walks in SoMa: The city’s most dangerous streets are those designed for speed, and they’re the deadliest at freeway ramps. The block between Fourth, Fifth, Harrison, and Bryant Streets is mostly occupied by four Highway 80 freeway ramps. At the corners where they touch down, 17 people were injured by drivers while walking between 2005 and 2012, according to CA Highway Patrol data. Twelve of those crashes involved “unsafe speed” as a primary factor. At the nearby intersection of Sixth and Brannan Streets, where Highway 280 ramps touch down in both directions, 29 pedestrians were injured by drivers traveling at unsafe speeds within the same period. On Sixth Street, which funnels freeway-bound drivers through one of the city’s densest neighborhoods, drivers injured 123 people on foot within those seven years. Supervisor Jane Kim’s District 6, which is comprised mainly of SoMa and the Tenderloin, has “the highest number of pedestrian fatalities in the city and the majority of the freeway on and off-ramps,” she noted. 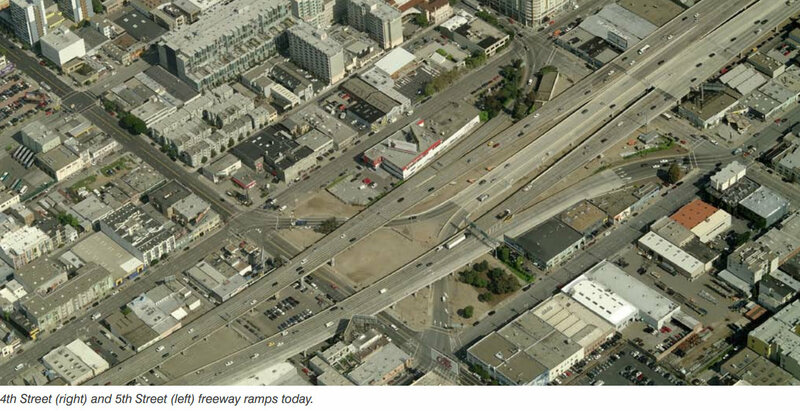 High-speed crashes at freeway ramps in SoMa regularly make headlines. On Saturday, an allegedly drunk driver barreled off the ramp at Seventh and Bryant Streets, just outside the Hall of Justice, and smashed into three parked cars. The driver was traveling fast enough to send two of the cars into Caffe Roma, narrowly missing a car with a woman and child inside. The driver, 41-year-old Marc Nagata, was hospitalized with life-threatening injuries and arrested on suspicion of driving under the influence. On the ramps near Fifth and Harrison, where Williams was killed, three motor vehicle occupants were also killed in 2014, including a 25-year-old driver whom police said was not impaired, but probably speeding, when she went over the side of the same ramp where Williams was killed. The driver who killed Williams, 27-year-old Jaime Juarez, was charged with gross vehicular manslaughter while intoxicated and two counts of DUI causing injury. It seems like many major “improvements” to offramps and the like, which are supposed to bring them up to modern standards, result in straightened curves and wider lanes: not so much making it safer, as making it easier to navigate at high speeds. This may succeed at keeping a reckless speeder from driving off the road, but it’ll only result in people entering city streets at higher speeds and with less attention paid. If anything, it might prevent an incompetent driver from hitting a wall (because he was driving too fast) only for him to later hit a person (because he was driving too fast). If anything, I think an offramp ought to have a curve which forces drivers to slow down. With plenty of signs announcing it, of course. That might help, e.g. in the case of Marc Nagata smashing cars into a cafe. I wonder what the results of the new Doyle Drive will be. I wonder what would constitute an improvement that would increase safety for peds and bikes? Simple, tear down the freeway. This death was caused by a drunk driver. How does one design streets and off-ramps to account for that? If the result was tall barriers along every section of street out there, would that be a desirable result? As someone else mentioned, an “improvement” to an off-ramp could be a wider off-ramp with more of a bank, which would lead to higher speeds. Make the off ramps narrower at the exit, decrease the radius of the turns off the freeway, and decrease the lane width to force motorist to brake earlier and move more slowly off the freeway. The main reason why these ramps are so dangerous to people off of them is that they do not provide any engineered controls that force people to move more slowly either entering or exiting the highway. Providing a straight ramp means that anyone driving too quickly can stay at highway speeds much too long before needing to brake. Braking should be happening before motorists reach the ramp instead. Thanks – that sounds reasonable, assuming Rogue Cyclist’s solution isn’t adopted. Won’t stop a drunk driver though. If anything, going into a tighter radius soon after being on a high speed freeway would lead a drunk driver like the one who killed Mr Williams to be more likely to fly off the ramp. I’m sure the people who live in SOMA would just love all the Bay Bridge traffic pouring into their neighborhood, not to mention how it would affect bicycling and walking conditions. Guess it’s not as simple as all that. Ridged pavement that would make the tires vibrate in such a way that the vibration could be heard and felt by the driver. The freeway through SOMA and on the Bay Bridge has the speed limit of 50 mph. During daytime the freeway and the surrounding streets are congested. The problem with speed occurs at times when traffic is reduced and when drivers are more likely to be under the influence. The roads are designed for peak needs, and the need does exist. However during overnight hours, traffic often slow down due to lane closures for construction work. You can build walls on the ramp to prevent a vehicle from “flying off” the on ramp. Typically what happens it that the car sustains a crash on the freeway ramp. What CalTrans and other highway builders have done, is externalized the cost crashes to the surrounding area. Instead of having a crash on the highway where it could (gasp) reduce capacity and cause a slow down of traffic, they instead happen off the highway. While in less built up areas this would be acceptable, as there typically can be added a large enough clear zone to accommodate this design, in the urban environment it generates it’s own hazards, because there simply isn’t the space to create an acceptably sized clear zone, or that space in a city is at such a premium that it gets used for other purposes, like homeless encampments. One doesn’t. One designs self driving cars. You build cities with the facilities to allow those who want to go get shitfaced to not drive home. I don’t know the story here, but many people drive after drinking “just a bit” and that’s often very questionable, and that’s simply because they have no alternative to driving. Something a little more permanent and less forgiving than the current Jersey barriers.